Inspired by conversations on the FOOD52 Hotline, we're sharing tips and tricks that make navigating all of our kitchens easier and more fun. Today, Amanda shows us the easiest way to stretch pizza dough. Pizza is one of the best and easiest go-to comfort foods, but we know there's a bit of hesitation in trying to make it at home. Don't let pizza stretch you out! Watch Amanda demonstrate how to stretch pizza dough, and once you're ready to shape your pizza with confidence, make pizza for breakfast with your children (or for yourself!). This video was shot by Alex Lisowski and edited by Kyle Orosz. Photos by James Ransom. corn meal is more authentic, but I've started putting my pies on parchment paper, trimming it once the dough is on it. Slides right off, crisp crust, no grit on the bottom of my pies. This was really helpful! 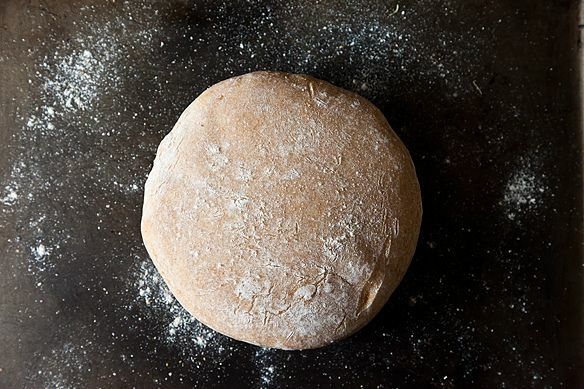 One question - how long did you let the pizza dough rest before shaping? Thanks! Great video, Amanda! I love the steering wheel technique. We had pizza on the grill last night - no oven. It was delicious! Great video Amanda. I always used to roll my dough out. This is so much easier. Thanks for sharing! Nice video! Say, I have meant to ask this for ages: what is the music you use in the Kitchen Confidence videos? It's charming, just right! Thank you! A dear friend made it for us.